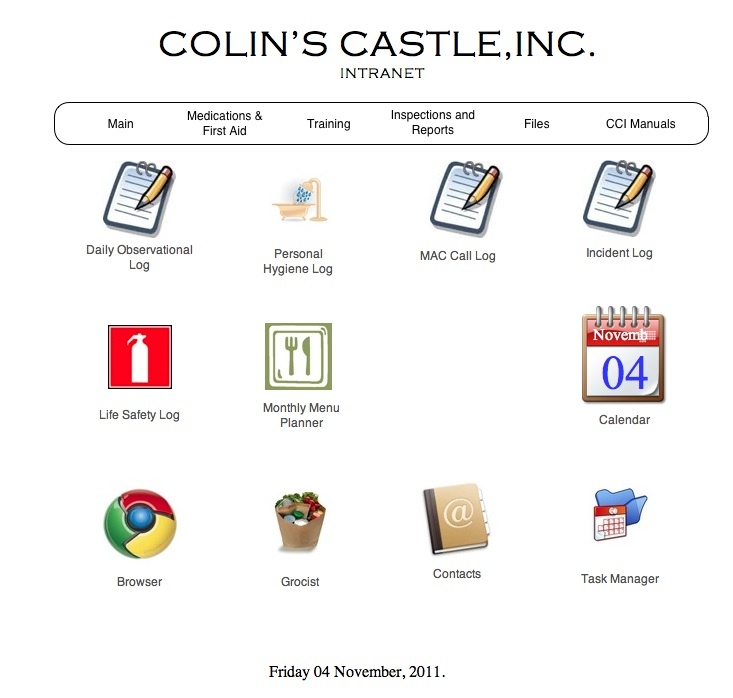 November 2011 - Colin's Castle, Inc.Colin's Castle, Inc. Since April 27, 2011 we have been taking severe weather warnings very seriously, and this includes Policies and Procedures at Colin’s Castle. Today we had a good Fire Exit Drill and Severe Weather Drill. Not much going on, we are in a “holding pattern”. 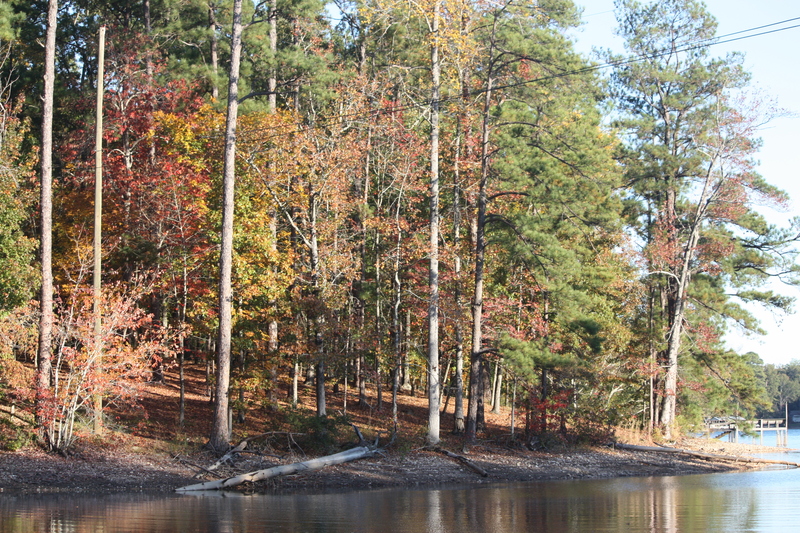 I have not received a reply from the DMH Commissioner nor Governor Bentley. I am considering asking the Board members to write their own letters. Eventually I hope that they will choose to quiet the squeaky wheel. In the meantime, Keith and I try to take Colin to Colin’s Castle as often as possible, and slowly we are trying to get Colin into a routine. We have an electronic log called the “Life Safety Log”. With the log we document the fridge temp, the freezer temp, the hot water temp, and sanitary issues as well. Documentation of these things is required by the Life Safety Code of the state as it relates to certified homes. Other documentation will commence in December. Today I will do an unannounced Fire Exit Drill and an unannounced Severe Weather Drill with Colin, and document these things as well. The completion of “the bed” will not occur until after Christmas, or probably after the first of the year. Paul Siciliano let me know that he is relocating from Virginia Beach to New England so that he can take care of his mother. I don’t envy him the move. p.s. Anytime anyone wants to visit, we welcome you. Most weekdays before noon Keith is at Colin’s Castle with Colin, and most weekends I am there for at least a few hours. C’mon by! 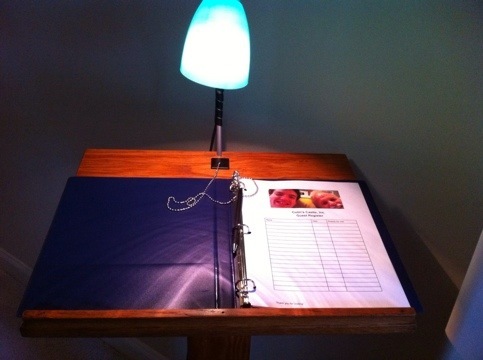 The guest book pictured above needs some signatures! We will be required to keep extensive documentation once we become operational, hopefully next spring. The requirements for this are quite onerous, but if it means that Colin’s Castle will be funded, we will gladly do it. We will be required to observe and document, keep records, maintain training records, keep logs of fire drills, fire extinguisher checks, and much more. In December, we will begin keeping all logs, documenting everything as if we were operational. That way we will work the bugs out before hand. I have developed an “Intranet” which is served internally within the home. On the intranet are links to all the required documents, manuals, logs, documentation, etc. 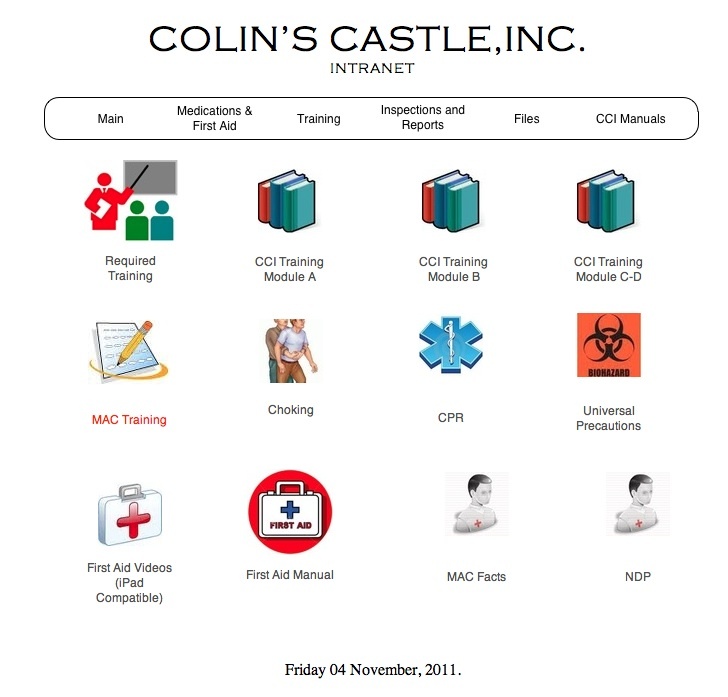 The intranet also contains all our training modules with links slideshows and tests. All of the records will be kept in “the cloud” so that any computer failure will not be disastrous. Below are some screenshots of the intranet. Anytime anyone wants to come see, let us know.